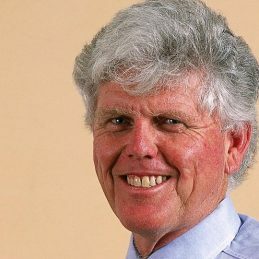 Many cricket experts believe that had Barry Richards not been a victim of the circumstances that would blight his career, he might have earned the right to be mentioned in the same breath as Sir Donald Bradman. Tony Greig considered Richards to be the finest batsman in the world and expressed the view “that in different circumstances I am convinced he could have rewritten the record books – and rewritten them with a style and grace matched by precious few players in the history of the game”. After Australia toured South Africa in 1970, and averaging 72 with bat, the young South African had no idea that it would be 21 years before South Africa would take part in International cricket again due to apartheid sanctions. Australia were due to host the South Africans in 1971/72, and for a long time it looked like the eagerly awaited opportunity for the Australians to avenge the crushing defeat that they had suffered two years previously would happen. In the end it didn’t, and with it ended the Test aspirations of a generation of South African cricketers. Partly to prepare for that series Richards had agreed to play for South Australia in the 1970/71 Sheffield Shield season. He scored 1,538 runs at 109.85 breaking records that belonged to Bradman. On 20th November 1970, at the WACA, he scored 325 runs, going on next day to 356. It was an excellent wicket for batting on, but the Western Australian attack included Dennis Lillee, Garth McKenzie and Tony Lock. Barry carved out a legendary English county career with Hampshire and quickly became one of the most popular players in the competition. Richards was one of the first to sign for Kerry Packer’s World Series Cricket in 1977. After seven long years without an international challenge playing for the WSC World XI over the next two seasons clearly meant a great deal more to him than the relaxing jolly that the not dissimilar series in England in 1970 had been. He expressed regret that the opportunity had not come earlier in his career, but stressed his desire to play again in the cauldron of international cricket. In his five Supertests he scored 554 runs at 79.14. And so to return to the comparison with Bradman. It is not without relevance to quote the great man himself on the subject of Richards; “You could never tire of watching him ….. it was a privilege to see him play”. The Don also had no hesitation in declaring that Richards was the best right-handed opening batsman he had seen. Post career Barry is a very popular commentator and will tour Australia this summer, Barry is available for events and functions.